Despite repeatedly describing himself as a “fun-runner”, Dave finished in the top half of competitors and looks every inch the long-distance runner. It’s remarkable, then, to learn that the lean-bean sitting opposite me was asthmatic and “extremely overweight” as a child. But wasn’t he scared to face his biggest challenge yet? “Not until two weeks before, after reading some horrendous race reports. People were suffering kidney and liver failure – they were put on drips and dropping like flies.” Since it began in 1998, the ‘marathon of the sands’ has claimed one life. 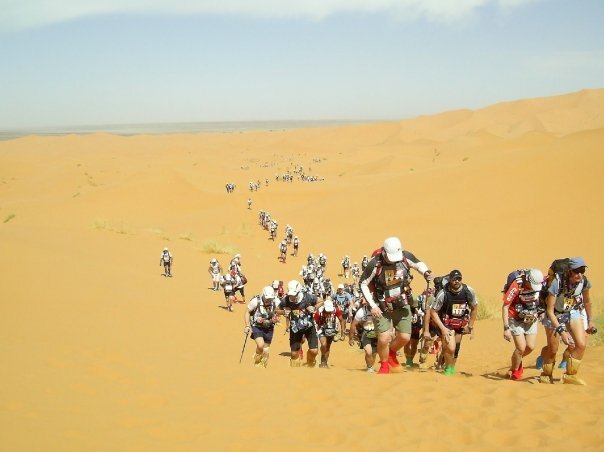 But whilst the thought of running 152 miles across the second highest sand dunes in Africa may make most mortals want to scream and run the other way, the race attracts over 800 plucky competitors of some 30 different nationalities, each of whom fork out £2000 just to enter. And as I watch the sparkle in Dave’s eyes as he recalls the experience, I realise that passing the toughest test of endurance available to humankind is undoubtedly highly satisfying. “I was buzzing for two weeks afterwards,” he gushes, “It’s something that I’ll always store away.” It’s how some, if they’re lucky, might describe their wedding day. Yet it is something of a relief to learn that even Dave “had no idea” how to train for an overwhelming distance under impossible conditions. “When I signed up for it [two years before the race itself] I was very blasé about it. When I signed up for the London marathon, I followed the training programme religiously. I was probably fitter for that,” he adds sheepishly. Dave earns his living as a chemist close to his home in Kent – so naturally he also did the bulk of his training there. 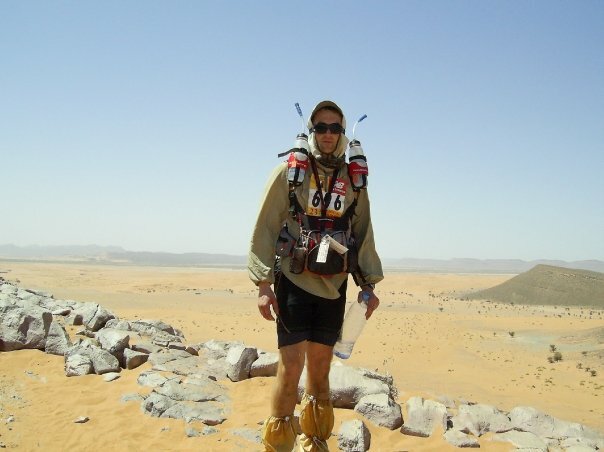 As it’s practically the polar opposite to the Sahara desert (where temperatures during the race exceeded 50 degrees Celsius), I was curious whether it was even possible to go fully prepared – particularly as Dave makes no bones about the fact that he’s “not that great” in hot weather. “Some guys sat in a sauna for a week beforehand,” he explained, “And some went abroad. I didn’t think it would be particularly beneficial. I thought I’d see what it was like when I got out there. And it was pretty tough,” he laughs. Nevertheless, Dave coped in the desert. At no point did he experience extreme pain, though he did suffer “some discomfort” when his feet swelled to a size larger than his usual . And although he found the longest day’s 46 miles “difficult”, he said that “because it was so beautiful, the time just flew. I cleared my mind and just floated along.” And he wasn’t even carrying an iPod. Others weren’t so “lucky”: 50 people didn’t finish; many developed “horrific” blisters and one unfortunate, as Dave recalls, “started tripping out. He thought the sand he was kicking up was spiders.” Dave avoided the potentially fatal effects of dehydration by setting his alarm to go off every 20 minutes – a reminder to take a salt tablet. Dave described the week as a “great community experience.” Each night he shared a tent with the same people and they would “swap stories” about their day. 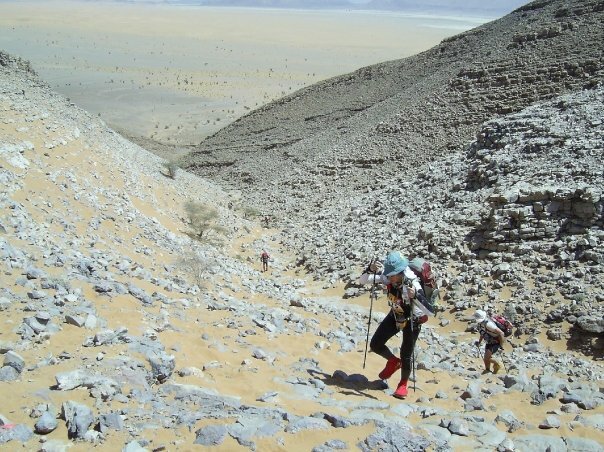 Sleep, however, was often inadequate, due to nightly sandstorms, and meals were of the freeze-dried variety, as runners are required to carry their supplies.